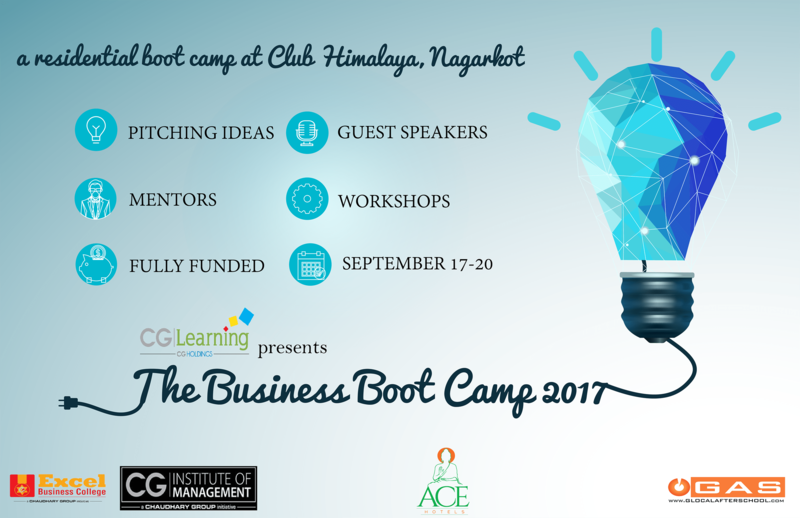 CG Learning brings “The Business Boot Camp 2017” via CG Institute of Management & Excel Business College, which has been designed by Glocal After School. It is 4 days residential program for students that focus on workshops and pitching to be held at Club Himalaya, Nagarkot. The workshops will be on making business plan, brainstorming, writing, pitching and presenting the idea, with an essence of leadership and personal development. It will be a great platform for networking, enjoyment, and recreation as well. The participants will be awarded certificates also appropriate ideas, if found, will be funded. The applicant must be pursuing their bachelor degree or completed high school. The applicant has to fill the online form within the deadline. The selection is based on the basis of application form filled by the applicants. The program is fully funded to 15 selected applicants which also include accommodation and food. The program is designed by Glocal After School (GAS), a venture of Glocal Pvt.Ltd. that aims to make skillful human resource by bridging the gap between industries and academia through soft skill training programs to students and corporate.